A new wireless satellite, innovative laser-communication technology for space applications, a universal adapter for satellite systems—these are just a sample of the winning entrants from the first INNOspace Masters competition. Initiated by the Space Administration of the German Aerospace Center (DLR), this event had invited innovators to submit their proposals and concepts for the New Space Economy. Around 50 startups, established companies, universities, and research institutes from eight European countries answered the call. After impressing the INNOspace Masters jury with their ideas, nine of these participants were nominated as finalists in three categories. 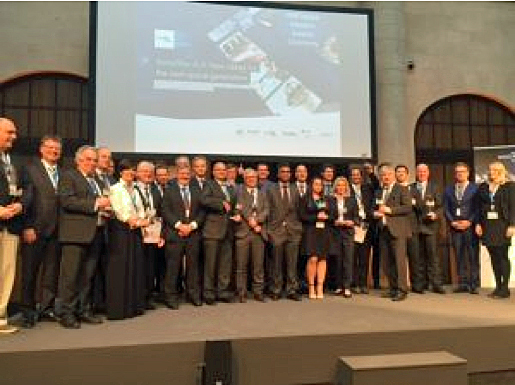 A subsequent awards ceremony was held on 4 May 2016 as part of the first INNOspace Masters Conference in Berlin. The participants had their choice of three categories related to different phases of development and production in aerospace missions. The DLR Space Administration Challenge focused on the research and development stage, while the Airbus Defence & Space Challenge called for proposals involving solutions that are ready for implementation today. The ESA BIC Startup Challenge, meanwhile, was centred on market-ready prototypes created during the ramp-up phase. These categories covered a number of important topic areas, including flexible platform concepts, intelligent components, and cyber-physical systems for complex production and logistics processes. The overall win for the competition, as well as the first place in the DLR Space Administration Challenge, were awarded to Professor Sergio Montenegro and Tobias Mikschl from the aerospace information technology faculty of the Julius Maximilian University of Würzburg (Germany). Their Skith project involves the world's first wireless satellite. Up until now, it has been necessary to interconnect all of an orbiter's individual components using electrical cables. Instead of cables, Skith uses miniaturized high-speed wireless modules capable of communicating across short distances in real time. This reduces costs and the effort involved in planning while increasing satellite flexibility and reliability. With OCULUS, Prof Enrico Stoll from the Institute for Space Systems at TU Braunschweig (Germany), Stefan Linke from INVENT GmbH, and Dr Andreas Dietz from the Fraunhofer Institute for Surface Engineering and Thin Films (IST) took second place in the same challenge. The OCULUS project combines various new production processes in applying highly reflective coatings to carbon structures, which makes it possible to manufacture lightweight optical mirrors for aerospace applications. Coming in third were Dr. Dirk Mayer and Rogério Salloum from the Fraunhofer Institute for Structural Durability and System Reliability (LBF) and Dr. Athanasios Dafnis and Andreas Dück from RWTH Aachen (Germany) with their idea for multi-functional lightweight structures for satellites. The winner of the Airbus Defence & Space Challenge, Dr Markus Knapek, CEO of ViaLight Communications GmbH, is working on laser communication terminals designed for use in future satellite mega-constellations that will operate in Low Earth Orbit (LEO). These terminals are capable of transmitting data across thousands of kilometres at rates up to 10 gigabits per second. The second-place entrant, Sandor Woldendorp from Airborne Aerospace B.V., submitted a concept involving the development of low-cost satellite constructions. Third place went to Antonio Valente from PLY Technologies GmbH for his OSS4SPACE (Open Sandwich Structures for Space) project, which seeks to help optimise the structures used in satellite panels. In the ESA BIC Startup Challenge, Giulia Federico, Ran Qedar and Saish Sridharan—founders of Space Products and Innovation UG —took home the top prize with the innovative multipurpose adapter MA61C. This universal adapter will make it possible to connect satellites' on-board computing systems with their respective subsystems without any additional programming. The result? Reductions in both the time and costs required in satellite manufacturing. The second place went to two projects: to Tuomas Tikka and Nemanja Jovanovic from Reaktor Space Lab Oy, who submitted a concept for implementing satellite development as a series of cyber-physical systems, and to Eduardo Remírez from JMP ingenieros SL with MPBUS, a modular energy bus for vehicles in space. INNOspace Masters is operated by the DLR Space Administration on behalf of the German Federal Ministry of Economic Affairs and Energy (BMWi). The competition constitutes part of the INNOspace initiative, which has been promoting innovations and the transfer of technology between the aerospace sector and other branches of industry since 2013. INNOspace Masters partners with the ESA Business Incubation Centers in Bavaria and Darmstadt (Germany) and Airbus Defence & Space. The competition is organised by Anwendungszentrum GmbH Oberpfaffenhofen (AZO), which also carries out Copernicus Masters and the European Satellite Navigation Competition (ESNC).